Maybe it is the fact that I took my first sip on December 21st (the Winter Solstice and the shortest day of the year). Maybe it was the mysterious stare of the man’s face emerging from the vegetation on Green Man’s iconic (and ancient) logo. Maybe it was the fact that the opaque color captured that same beautiful black essence of the coffee I sipped earlier on that same frigid winter morning. 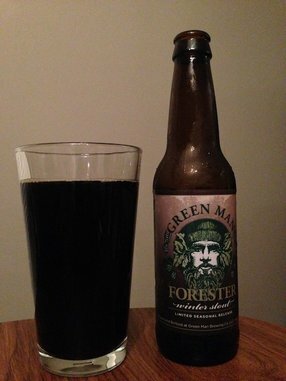 Whatever it was, I knew with the first sip that Forester, Green Man Brewery’s seasonal winter stout, was a beverage that calls for slow contemplation. Like, take a hike in nature and smell the roses (while drinking a beer) kind of contemplation. This is no session beer, and I’m glad for it. Roasted black and chocolate malts provide the reliable and expected backbone of a solid seasonal stout. However, clocking in at 60 IBU’s, there is an underlying and surprising shock of hoppiness that hits the palate. The bitterness actually amps up the expected malty comfort to new and delightful heights. With each sip, it seems that new notes and nuances are emerging and they all seem to whisper, “This is what winter in the mountains should taste like.” Drinking Forester, I instantly long for a rustic cabin complete with a roaring fire, sleeping dog, a long novel and an even longer beard. Green Man Brewery in Asheville, N.C. has been holding many under its quiet spell since it first started filling pints as Asheville’s second official brewery back in 1997. In those days, the beer was being brewed in old dairy tanks in its mother-ship pub, Jack of the Wood. Fast-forward sixteen years. The legendary beers are still the house brews at the popular Jack of the Wood pub, but since 2005 Green Man has been rocking it out at their own taproom/brewery in Asheville’s industrially hip and gritty South Slope neighborhood. They currently may not have the foot traffic of a core downtown tasting room, but once most find Green Man, they never want to leave. International football (that’s soccer, to you and me) games play in the brewpub all the time, and complimentary pretzels with the addictive (and local) Lusty Monk mustards round out the taproom’s vibe. With a recent expansion of their production facility and now bottled distribution across the entire state (and soon SC! ), Green Man sees only a bright future ahead. Even the beloved Kenny Powers, from the cult-fave hit series East Bound and Down was seen in a recent episode savoring a Green Man ESB in the comfort of his own kitchen. If Kenny tries the Forester, I am confident that he too will be longing for solitude in that cabin in the mountains.